Living in BBH, Boothbay Harbor Maine is paradise as we are here for a week leading up to the bi-annual Island Packet Yacht Owner’s Rendezvous hosted by Norm and Mary Pierce of Pierce Yachts. Norm is so helpful with the Island Packet Fleet and everyone highly respects his open and honest help and support. The IPY Maine Rendezvous will be Fri, Sat, and Sun with events planned to bring the fleet together to share and to learn topics related to our yacht ownership. As the local Maine dealer, Norm organizes and hosts this event every other year. Owners sail up to Maine to participate in the event. This year 25-30 boats should be here! We are here a few days early because we love the BBH town center, shops, ice cream parlors, library, shuttle bus, and friendly Maine people. There is something special about Maine; besides the scenic beauty, it has to be the people. We will enjoy life in BBH for this week and we will be sad to see it end. I am working on a full photo essay of the BBH town, and will post that later, for now…. Our local lobsta retailer…fresh caught everyday! $8.50 per pound live lobsta….Got Lobsta? We did not plan to run 70 miles today, but the weather changed underway, so we decided to press on another 20 miles and reach Boothbay Harbor Maine before the front. Last night we were anchored in Isles of Shoals 8 miles off the NH coast and we were treated to the most spectacular sunset we have ever watched. The lighting on the rocks to our stern and the golden colored sunset off our bow was breathtaking. Radeen and I both are so grateful and appreciative that we have this opportunity and time and good health to live this sailing life and our lifetime dream. This sunset made us both take time to reflect. With flat calm seas and clear skies we depart the Isles of Shoals for Maine, planning on anchoring near Cape Small, the closest point towards our destination of Boothbay. Underway, it was so calm that we sanded and re-varnished the port stern cap rail of teak around 10am! Then as we crossed the Portland shipping lanes 8 miles off shore and in 350 foot deep water, we were treated to TWO WHALE SIGHTINGS! One off our starboard beam about 4 boat lengths away, and the other, 30 minutes later surfaced off our port BOW about two boat lengths away. This one was swimming across our bow! This second one was a humpback whale and was ….VERY LARGE….I tried to get video but the WHALE never resurfaced, thank goodness as it crossed our bow. We heard other boats talking about WHALES in the area, but these two sightings were the only ones we saw. Welcome to MAINE, we call it a fairyland because it seems too good to be true, to beautiful to be reality, it truly seems like a dream land. We both agree, we have never seen anything as beautiful as Maine! Arriving into Boothbay Harbor, Maine by water is spectacular, as you pass lighthouses and islands with summer homes on rock lined shores with pine trees down to the high water mark. White waves crashing onto the rocks and splashing into the air contrast to the dark greens of the pines, even in the low light, rainy overcast day, the lighting was still spectacular. I find it difficult to describe the true beauty, you simply have to sail into Maine and discover it for yourself….Welcome to Maine, our 3rd visit by water. 5,368 lives lost at sea since 1716! Sailing from Scituate north across Massachusetts Bay can be a beautiful sail when the winds are west as we had. This places the boat on a beam reach so the seas were delightfully flat calm as we reached north towards Gloucester Mass, a place we have never visited. Since this was highly recommended by our good friends Ed and Sue K. we decided to stay in Gloucester for 2 days and search for the best chowder and all the town has to offer. Well, the town has not been disappointing! From the downtown Federal anchorage spot to the beaches, town center, restaurants and charming shops all surrounded by the largest commercial fishing fleet in the USA, Gloucester is a very interesting harbor. One of the highlights was re-connecting with fellow Island Packet friends Martha and Bob of IP-420 Entropy, who kindly picked us up at the Coast Guard Station for a driving tour of the Cape Ann area. Then we had a lovely seafood dinner at the Lobsta Land Restaurant located on the marsh where the sun setting made for a beautiful visit. Thank you, Martha and Bob, for your time and your hospitality, how kind of you! As recommended by Martha and Bob, on Saturday we walked to the Fisherman’s Memorial, across the busy lift bridge at the Blynman Canal and then to the Causeway Restaurant to gladly wait in line the most delicious clam chowder on the planet! We have not explored this town fully, so we will plan to return on our way south. Today we will continue north to the Isle of Shoals in NH as we progress toward Maine. Here are more photos of the Gloucester Ma area…. Commercial fishing boat, look at the scale, see the tiny people on the bow! Even the bars and pubs serve Lobster! Our boat anchored in the harbor, 28 feet deep, 150 feet of chain out, 9 foot tides! Reefed Main Sail, FULL 135% Jenny + Staysail, all out! These Island Packet Yachts can handle high winds, 33 knots true here! This is our fourth trip north through the Cape Cod Canal and every time it gets my adrenalin elevated because of the various conditions of weather, shipping, and 3 to 4 knot current added to the 10 foot tides! This time was no different, we had it all: Fog with 1/4 mile visibility or less, a closed railroad bridge that we could not even see, and two tugs pushing loaded oil barges, WELCOME TO THE CAPE COD CANAL! Yes, that’s a Railroad bridge, it was DOWN just minutes ago! I always say these New England sailors are a hardy bunch and we Chesapeake sailors have no clue what they endure until we try it for ourselves. We ran north east up Buzzards Bay into fog with about 1/2 mile visibility which is good for this area, then we entered the Cape Cod Canal right behind the “A.J. McAllister” who works the canal pushing barges through to the other side. We never saw him but we knew he was there via our computer’s AIS, automated identification system. This system tells us the course, speed and direction of commercial ships and how close they will pass you. We love this system as it answers the most important question: WILL THEY HIT US? Notice the 10 foot tide that is DOWN. These fisherman are sitting above the high tide mark! After exiting the canal, we enjoyed a brisk 25 knot SW wind in Cape Cod Bay. We sailed this wind for 26 miles up to Scituate Harbor, MA. Of course this wind built to a solid 30 knots with many gusts up to 35 knots. Here we were again, sailing in strong winds but our little Island Spirit took it like a champ and sailed many miles at or above hull speed of 7.2 knots and many times at 8.2 knots! It was a great day! The highlight the day was a visit from our special friend, Jason, and his new bride, Whitney, who were in Boston on business. We enjoyed snacks, cocktails and fun stories of their St. Lucia honeymoon. Jason is the son of Radeen’s college roommate and good friend; they are family. Thank you Jason and Whitney for making the effort to visit Island Spirit. We really enjoyed seeing you both! 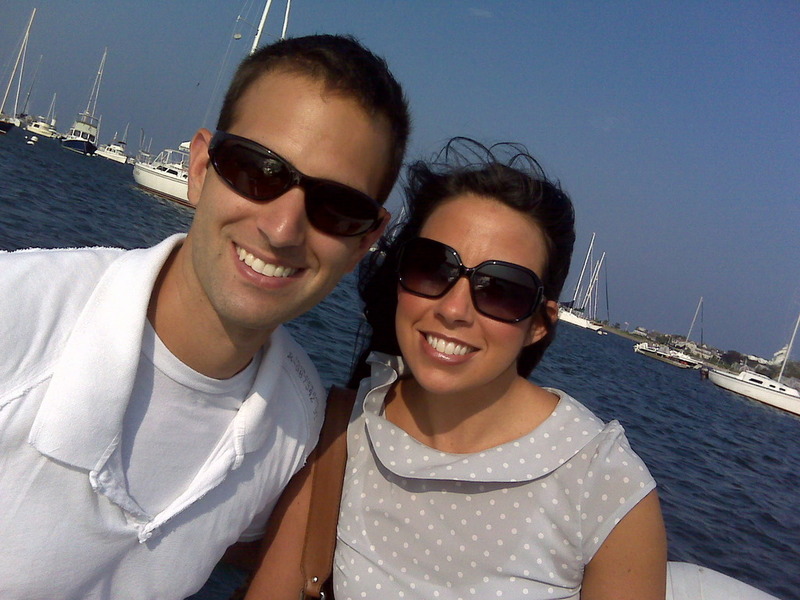 Jason and Whitney arrive at Scituate Harbor, MA, what a special visit. Jamestown, RI, has a wonderful spot named Dutch Harbor on the west side of the island, and this is where we reflected and celebrated our 31st wedding anniversary with boating friends. Our good friend Carey organized a gathering called a Mini-vous. A mini-vous is a small rendezvous of boat owners who raft up, or anchor nearby and gather for fun cocktail party. The AM started off with a walk to Jamestown for breakfast and to find Radeen the perfect anniversary gift. We found it….a special corner tower Condo, overlooking the Jamestown harbor…. Radeen’s Anniversary gift, a new condo! After a quick presentation of the $995,000.00 price tag, I decided we needed to be more reasonable. So, off to the Jamestown Hardware Store…. …where we found the PERFECT gift….a NEW SPRAY bottle to use when water proofing the canvas. Radeen just had to have one and they were on sale for $2.70. What a deal. Why do I spoil Radeen so much?….look at this….a new spray bottle! Enjoying the raft up on SP Cruiser, CATSPAW, thank you Carey and Bobbie. Boats attending: Mise en Place, Lafalot, Tiller the Hun, and Island Spirit, plus a Catalina 380 from the Wickford Yacht Club. And even TILLER the CAT had a fun time. Carey’s cat with more sea miles than most yacht owners, RI to FL to Bahamas and back several times! The true beauty of cruising is sharing fun times with the good friends we have made. Thank you Carey for the fun mini-vous, we really enjoy Dutch Harbor, RI. The graves face east, on a hill overlooking the Great Salt Pond. The Block Island Historical Society started sponsoring Cemetery Tours last summer. We were glad to join a large group of people on a sunny Sunday evening for the first one this year. The cemetery is unusual because it spans over 330 years of the styles of headstones, materials, carving techniques and materials in a small area. The first headstones were brought by settlers from England and were made from brownstone and slate. Later, they were made from granite and marble. Footstones bearing the initials of the deceased were popular for many decades. Headstones were carved on the west side, facing away from the grave. Though this was always a town cemetery, until recently it was the responsibility of each family to maintain their plot, resulting in some areas looking like meadows by mid-summer and subject to criticism by their neighbors. One of the tour guides is herself a stone carver, making modern day headstones on the Island and the other is a historian. Both of the them are descendents of the original 16 families who formed a company and settled the Island in 1661. Fascinating history! There will be another tour on August 17 at 6 pm. The oldest grave, 1687, of one of the original settlers from 1661. The legible part is illuminated by the reflection from a mirror. Sadly we depart Block Island but we will return in mid Aug.
Aldo’s Bakery delivers fresh pastries to the anchored boats! Going to shore from anchor requires you to navigate the dinghy dock! Rule #1: Climb over the LARGEST dinghy, it is easier! The ferry dock is the hub of the town, here, the Saturday AM crowds arrive! ALDO….how can we resist? I am on my way! THANK YOU Bobby! It is only 175 miles from Atlantic City NJ to Block Island RI via a direct Atlantic Ocean passage, so what could be so rough? The weather forecast was perfect – west winds 10-15 knots then building to 20 knots and shifting to the north. Well, that sounds perfect since our course to Block is 060 which is North East. So we decided to depart, knowing that we would have building winds at night but only up to 20 knots. Now for the reality: Weather forecasts are often WRONG and forecasted winds speeds are on the LIGHT side. So, how bad could it get? Look honey….a beautiful sky and sunset! Daybreak came and the winds were down to 25 knots as we approached Montauk Point hoping for Block Island to appear over the bow. Arriving Block at 4pm, we completed the passage in 32 hours and we were BEAT. The wonderful aspect to Block Island is the Great Salt Pond where you can pick a spot and drop anchor, sleep in calm waters and be awakened by “ANDIAMO…ANDIAMO!” calling from the pastry boat. We were delighted to be greeted by Jim & Laurie on Kismet, IP350, and Conrad & Sally on It’s About Time, IP38. We are so fortunate to be have such a well-connected and friendly Island Packet community! Life is the best on Block Island. WE MADE IT NOW….time to relax! Look at that…tractor trailers stacked 8 high and we have seen 10 high ! Close up of the SALT on the upper windshield over the dodger . Up for nearly 40 hours…we are beat…but very HAPPY! Coney Island NY or Sandy Hookn NJ. We hope not, but that's the plan. our progress on the map. See our SPOT MAP page link at top of blog. Remember…we now have no plan and no schedule, so we thought we would take a rest day in Cape May, NJ…..WRONG…the winds were too good to stay in port! With 20 knots of west winds, we decided to head out the Cape May Inlet and set sail for Atlantic City, NJ. So, being lazy cruisers and not racers, we simply rolled out our 135% jib and sailed at hull speed with this alone. Our hull speed is 7.2 knots, so if we see that speed through the water, then we have no need for more sail. Winds were 20-25 knots with some solid long gusts of 33 knots for a great beam reach up the coast. The fun aspect to sailing close to shore is that you can watch the wonderful towns of the Jersey Shore go by, like Wildwood Crest, Wildwood, Avalon, Ocean City, and then Atlantic City. Our families & friends have always taken summer vacations to the shore and many times we would see sailboats off the coast. Now, we are providing that fun scene for today’s young families. At Rum Point, you cross a sandbar with homemade red marks! We eventually had to bring out the main sail when the winds died down to 15 knots. That seems to be minimum needed for ocean sailing for us, we like 15-20 knots. We sailed right into the Absecon Inlet and then started the motor and dropped the sails. Luckily, the tide was high and we traversed the Rum Point sand bar following two tourist boats into the greatest little cove in this area. In 2007, we spent a week on anchor here as we wrapped up our first Drexel University term, writing research papers. Today…no work, just fun, what a treat. Looks like we will challenge the direct run to Block Island from here at 0500hrs. That will get us over the sandbar at high tide. Next stop, ….BLOCK and if not…we will end up at Sandy Hook or Coney Island, NY. Who knows….